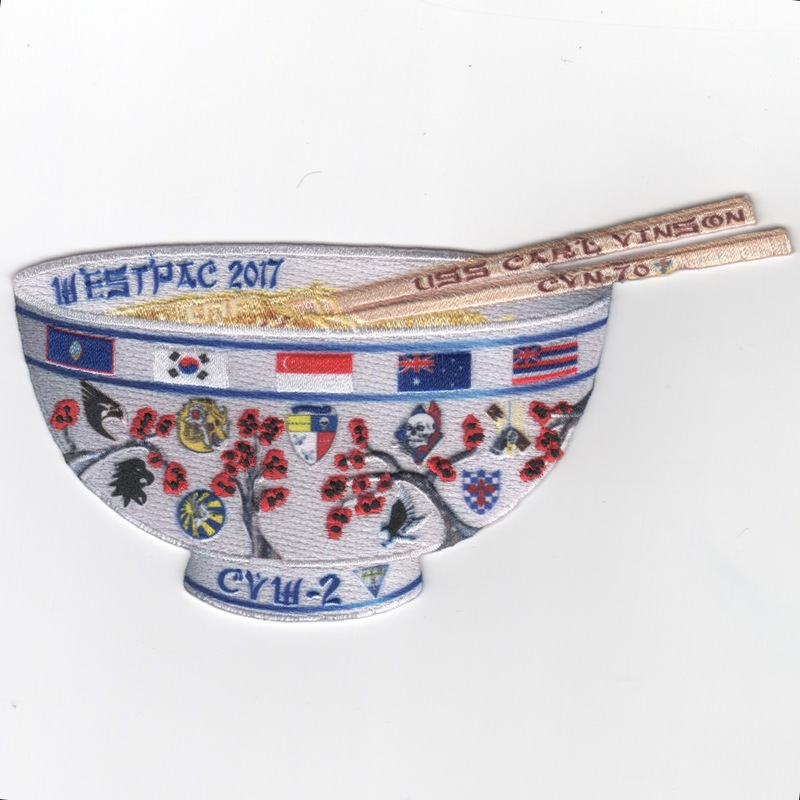 This is one of the 2017 WestPac cruise patches created by AV8RSTUFF for VFA-2 while onboard the USS Carl Vinson (CVN-70) and attached to Carrier Air Wing Two (CVW-2) using the new 'hubrid/sublimation' technology giving incredible detail. There are some very "interesting" things hidden in the artwork that you will have to discover, but an AMAZING patch. Yet another of our designs created for them......this patch does not come with velcro. 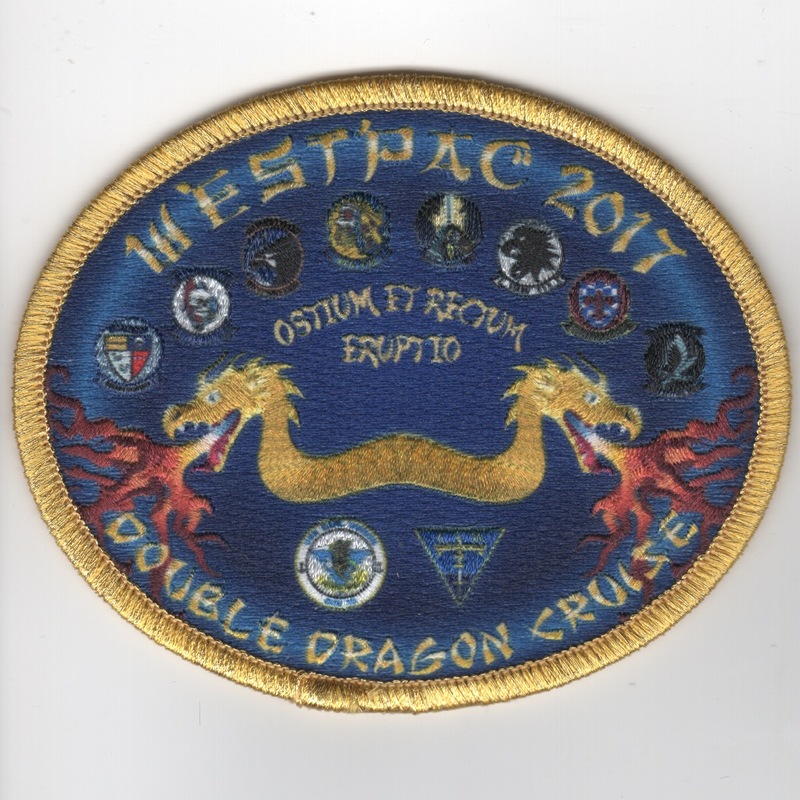 This is the 2017 WestPac "DOUBLE DRAGON" cruise patch created by AV8RSTUFF for VFA-192. 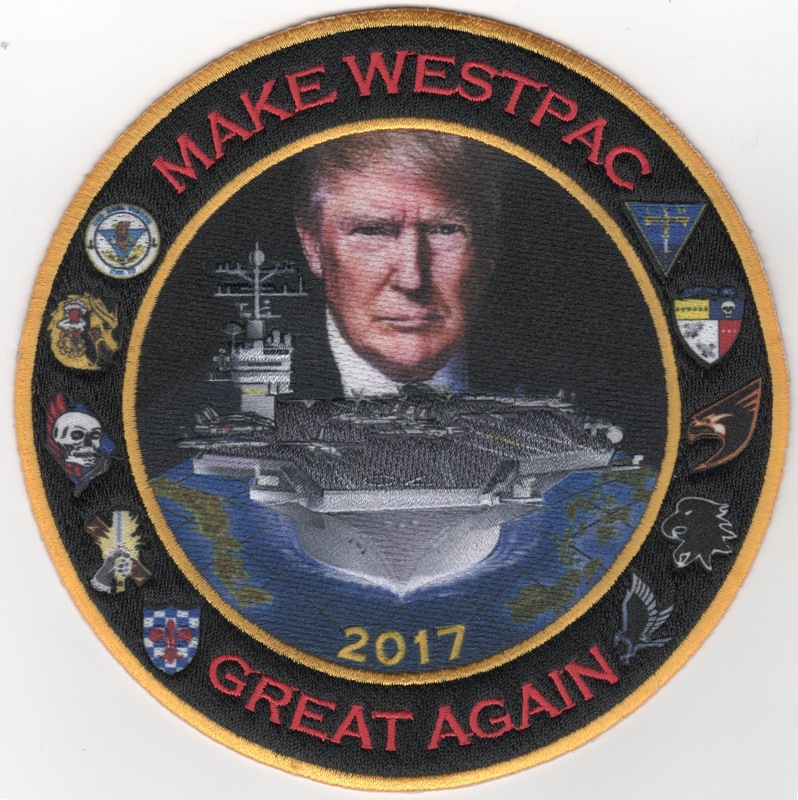 This patch depicts Trump, the "gaggle" of squadrons in the AirWing, CVN-70 and uses the the "HYBRID" technology means of creating patches which shows the greatest detail EVER on a patch.....pictures don't do this patch justice!!! Get yours now while they are still in stock! This is the patch created by CVN-70 for their 2016 Airwing for their "workups" prior to deploying. It says "ENHANCED COMPTUEX" across the top with "IMMACOMATCHU" in the middle and "HOT PLATES IN AT LEAST 1 HOUR" along the bottom. 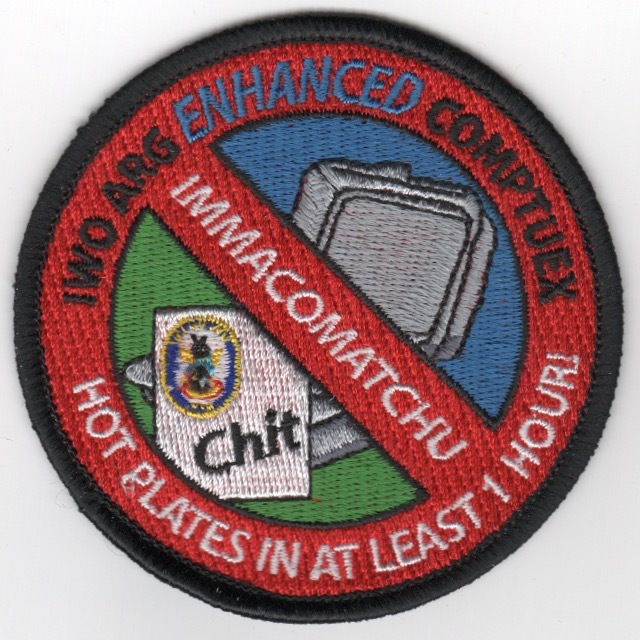 Don't see a COMPTUEX patch very often! This patch does not have velcro. 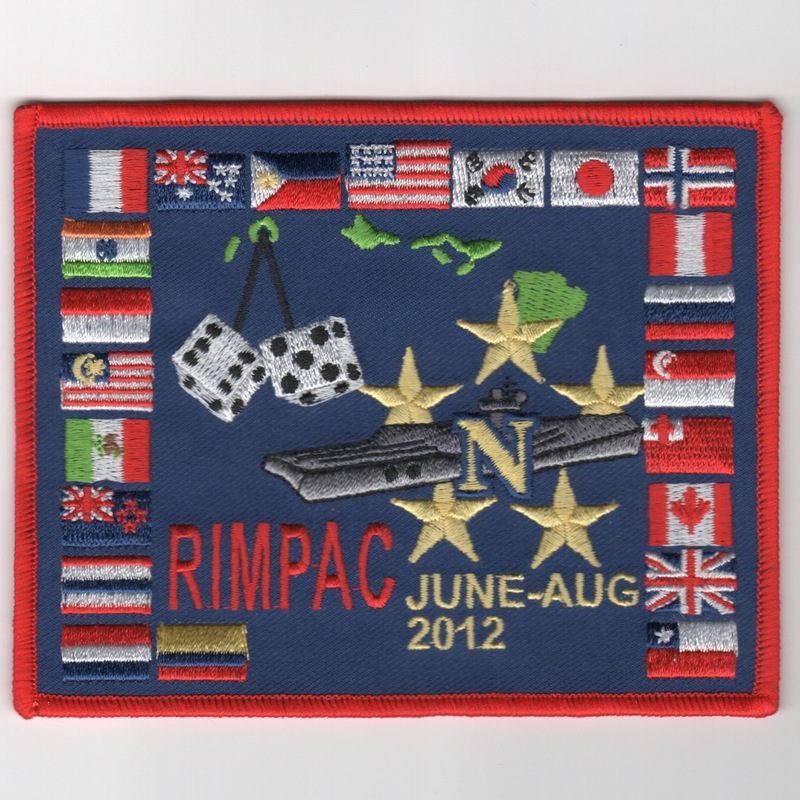 This is the patch created by CVN-70 and Airwing 11 for their 2012 June-Aug RIMPAC cruise. This shows the Dice with the numbers "6" and "5" (for Airwing 11) and the flags of all the countries that also participated in the exercise (note, it was only for THREE months). This patch does not have velcro. 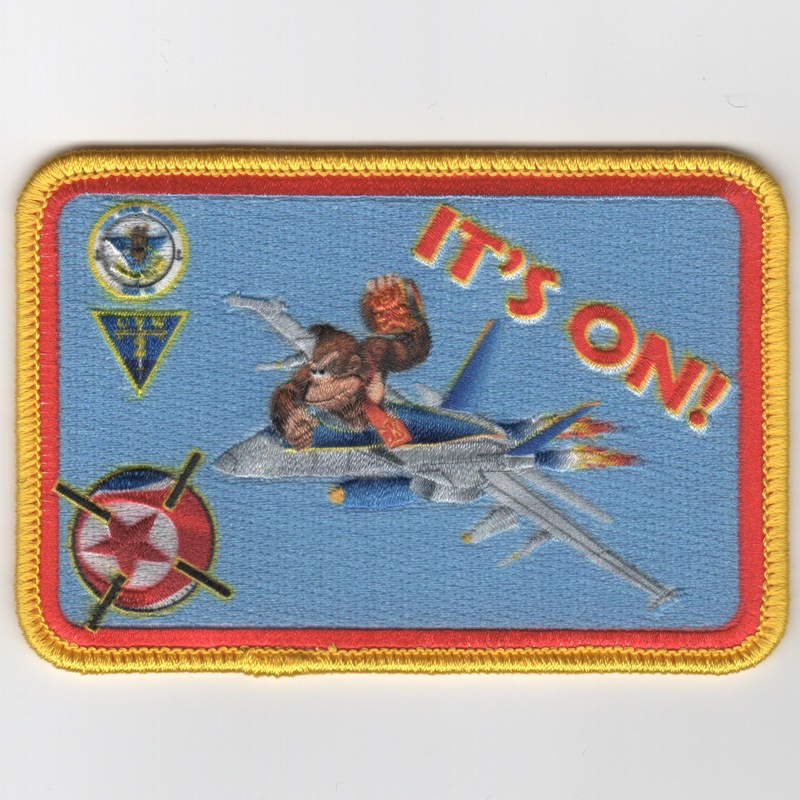 This is the "Crossing the Line" patch for the CVN-70 USS Carl Vinson and Airwing 14. Once you cross the line, you become a "Shellback". This is the "Shagadelic, Baby!" 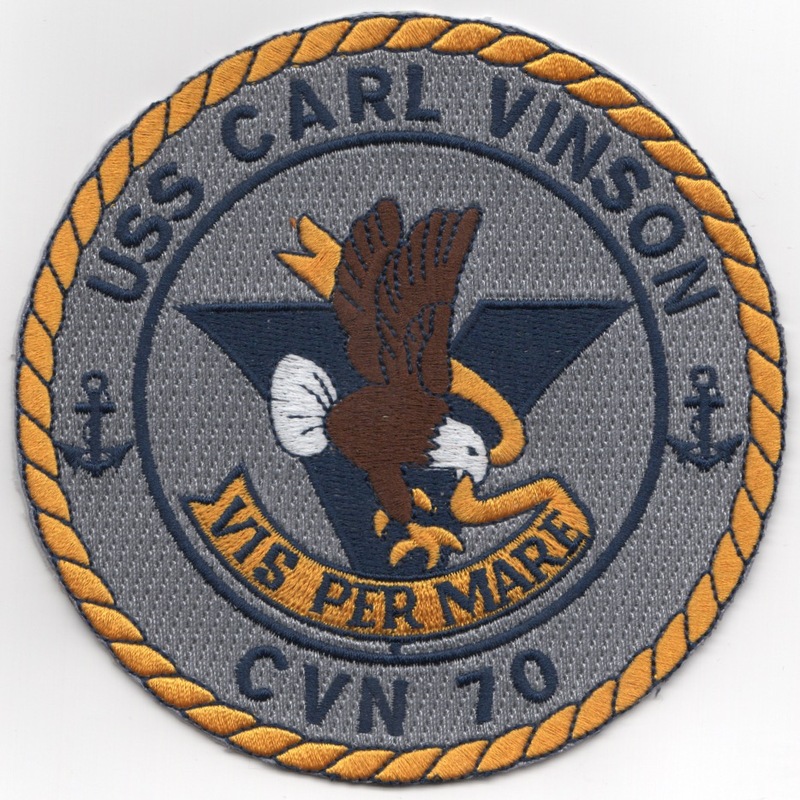 patch for the CVN-70 USS Carl Vinson. It includes the squadrons that participated in the cruise alongs the sides and bottom. It is fashioned after the Austin Powers movies. It's a really cool patch. 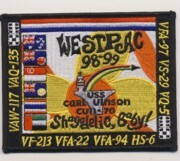 The USS Carl Vinson's '94 WestPac Cruise Patch. Attached squadrons were VAW-113, VA-196, VFA-113, VFA-25, VF-31, HS-4, VF-11, VS-35, and VAQ-139. VA-196 was the last A-6E Intruder cruise from the West Coast. 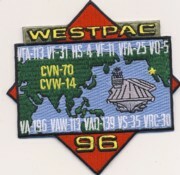 The USS Carl Vinson's '96 WestPac Cruise Patch. Attached squadrons were VAW-113, VA-196, VFA-113, VFA-25, VF-31, HS-4, VF-11, VS-35, and VAQ-139. This was the last A-6E Intruder cruise from the West Coast. 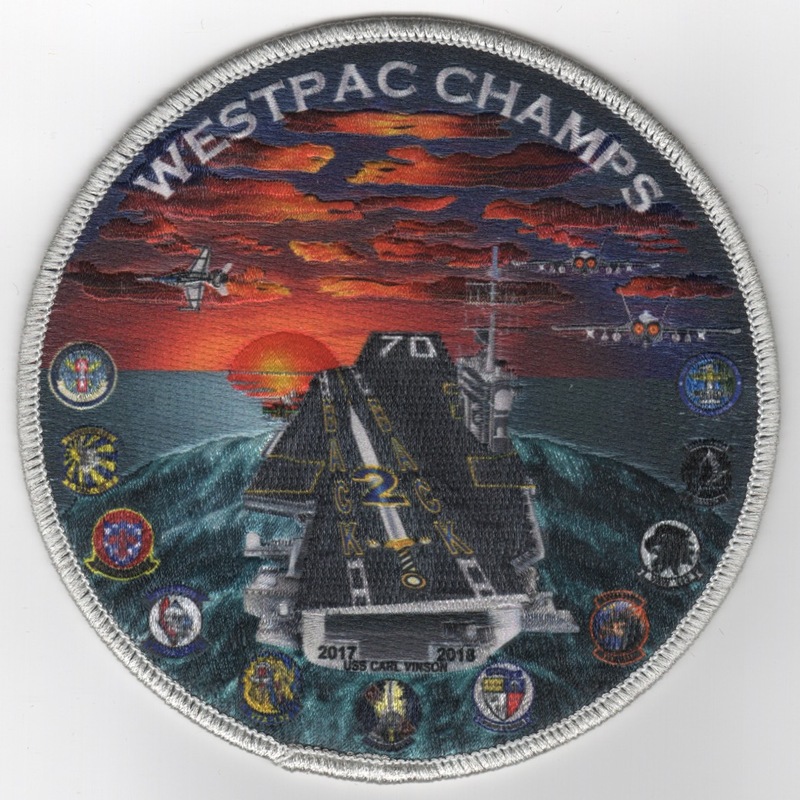 This is the diamond version of one of the USS Carl Vinson's '96 WestPac Cruise Patch. Attached squadrons were VAW-113, VA-196, VFA-113, VFA-25, VF-31, HS-4, VF-11, VS-35, and VAQ-139. This was the last A-6E Intruder cruise from the West Coast. This is one of the other USS Carl Vinson's WestPac Cruise Patch for Operation Enduring Freedom. Shown are all the attached squadron's mascots as well as the date for the first strike in our war against terrorism. This patch is also from the USS Carl Vinson (CVN-70) for Operation Enduring Freedom, but was the one created by the VF-213 BLack Lions while on cruise. It shows the Twin Towers as well as the Pentagon. 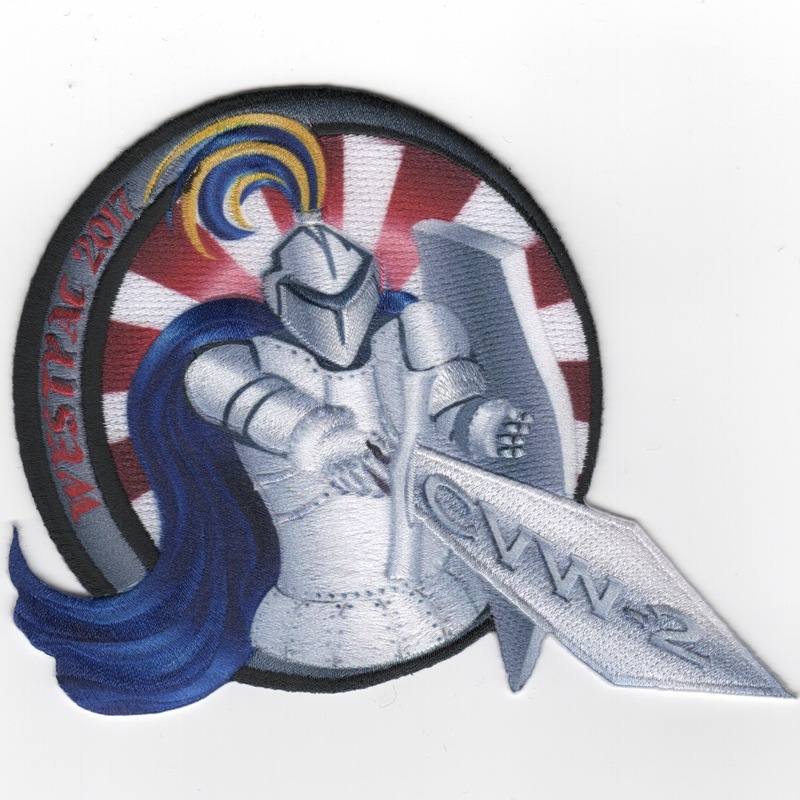 This patch is from the E-2C Hawkeye squadron from CVN-70 while on their latest OEF cruise. The VAW-117 "Wallbangers" created this patch while operating from the Carl Vinson as the controlling unit for CVW-11. This is the "diamond" patch created for all the carriers that were in the "box" supporting the war on terrorism at the same time. The carriers were CVN-70/CVN-65/CV-63/CVN-71/CVN-74. The patch says "Everyone's Gettin' Some!". This is the "Energizer Bunny" patch created by Airwing 9 while onboard the USS Carl Vinson (CVN-70) for their WestPac 2003 OIF cruise. 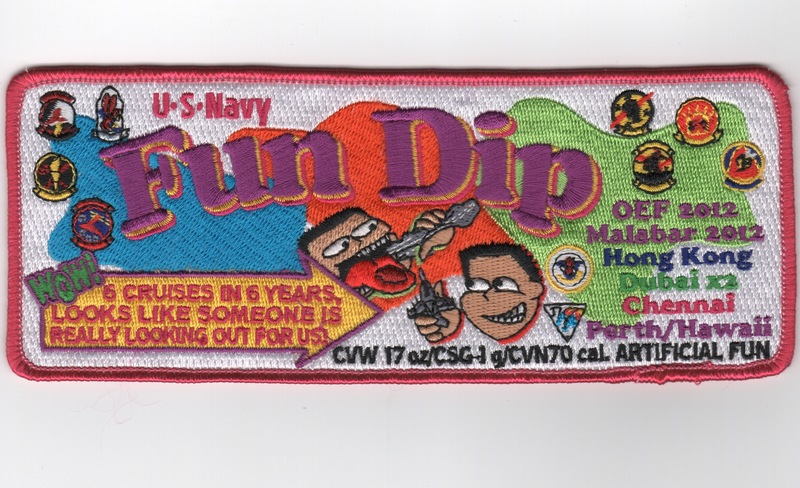 This is the "Bart Simpson - I Wasn't There" cruise patch for the USS Carl Vinson (CVN-70) for their WestPac/Operation Iraqi Freedom 2003 cruise patch. 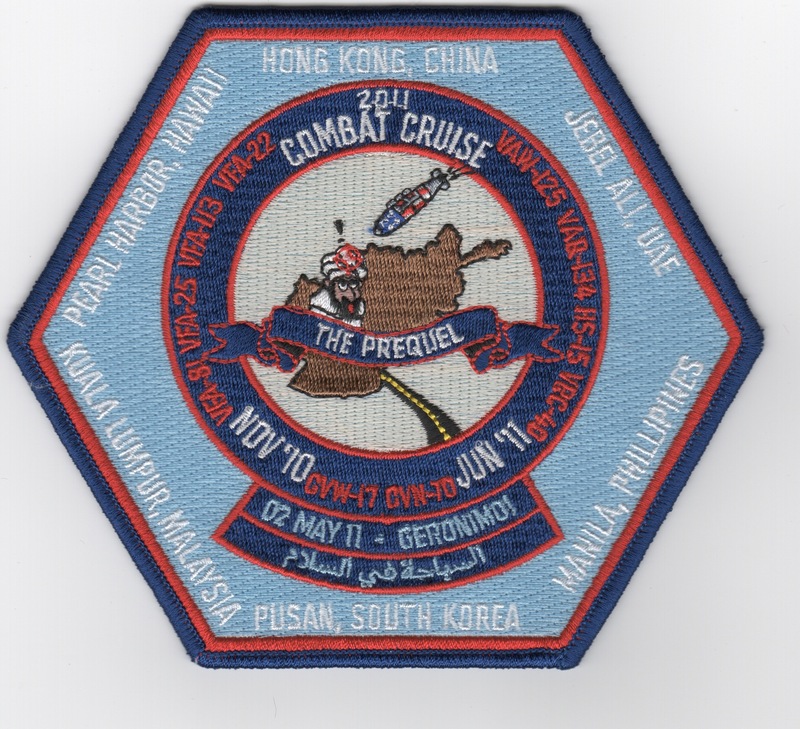 This is the "Operation Turning Spare" cruise patch for the USS Carl Vinson (CVN-70) for their WestPac/Operation Iraqi Freedom 2003 cruise patch. This cruise patch is for Airwing 17 while onboard the USS Carl Vinson. 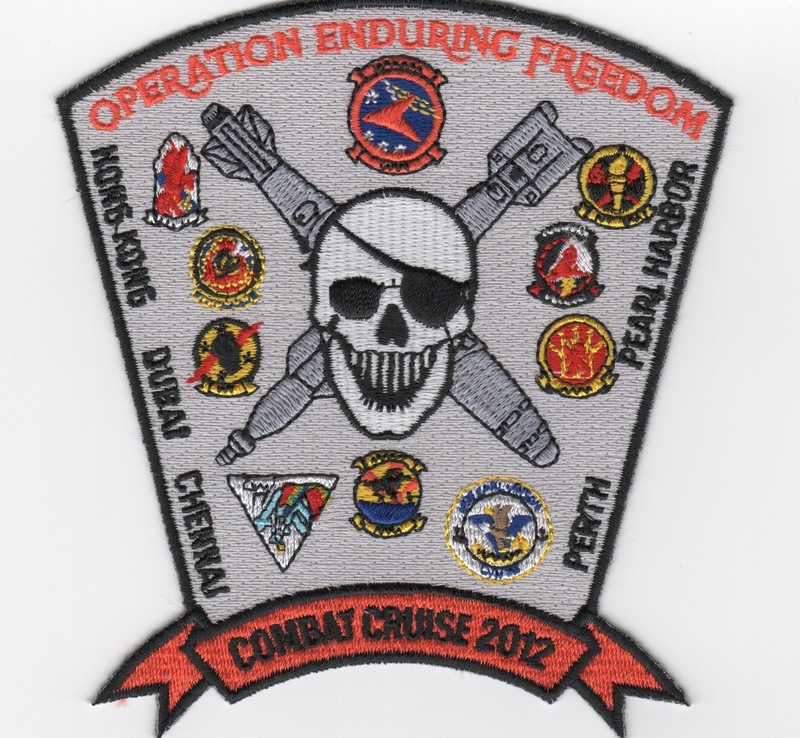 It says OPERATION ENDURING FREEDOM across the top and COMBAT CRUISE 2012 along the bottom with all the squadron insignias. 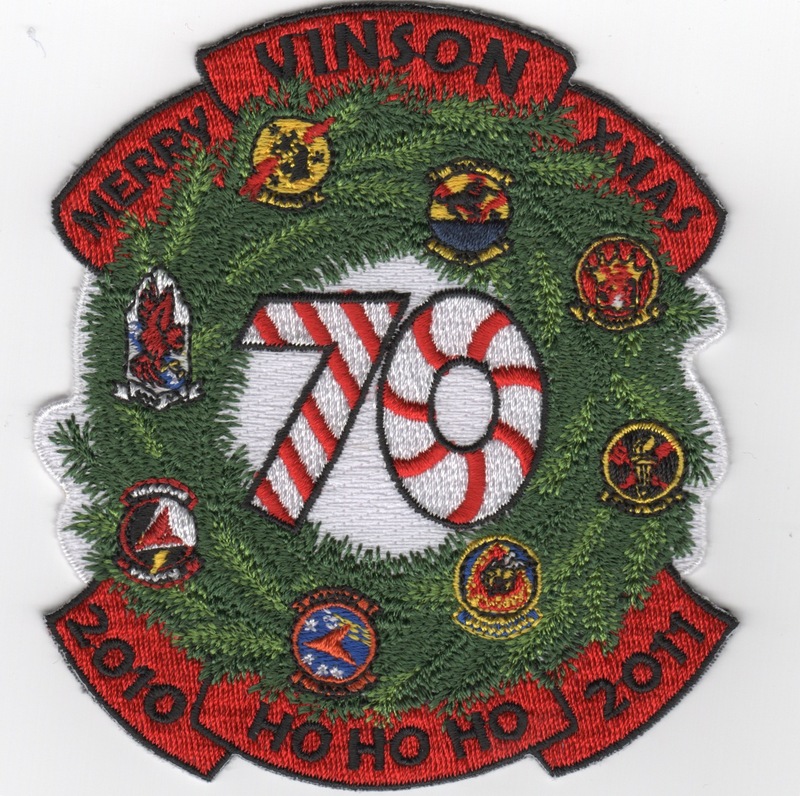 This is the 2010-2011 "Christmas Cruise" patch is for CVN-70. It shows all the squadron insignias around it with a Wreath and "peppermint" numbers. This cruise patch is for Airwing 17 while onboard the USS Carl Vinson. It says 2011 Combat Cruise and is hexagonal in shape. It lists all the port calls and squadrons on the ship. 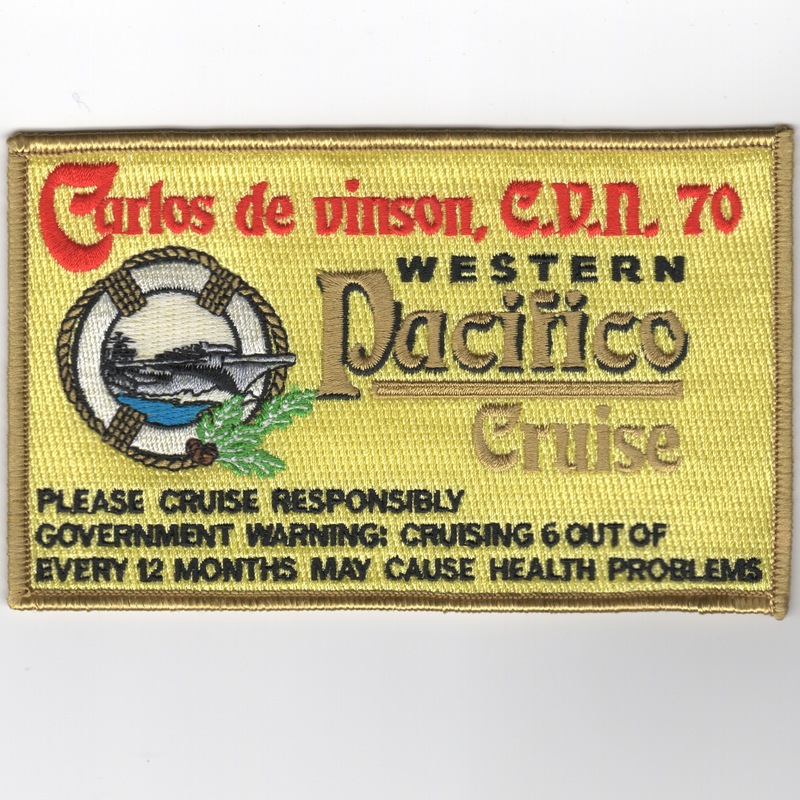 This is one of the cruise patches for the USS Carl Vinson (CVN-70) for their WestPac 2003 cruise patch. This is the "100 Traps" Centurion patch given to those who have 100 "Daytime" Traps onboard the USS Carl Vinson (CVN-70). 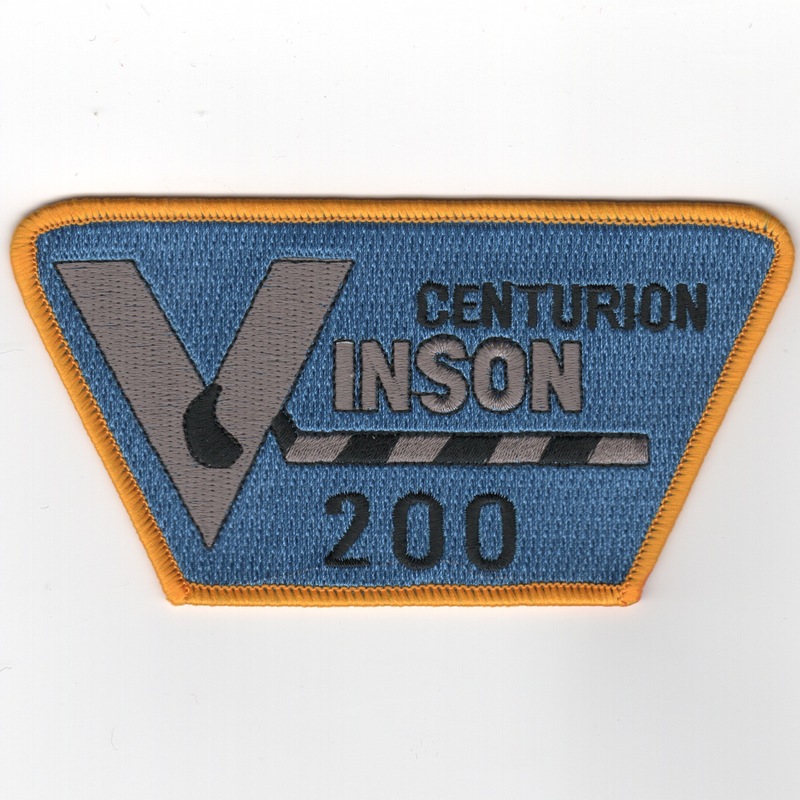 This is the "200 Traps" Centurion patch given to those who have 200 "Daytime" Traps onboard the USS Carl Vinson (CVN-70). 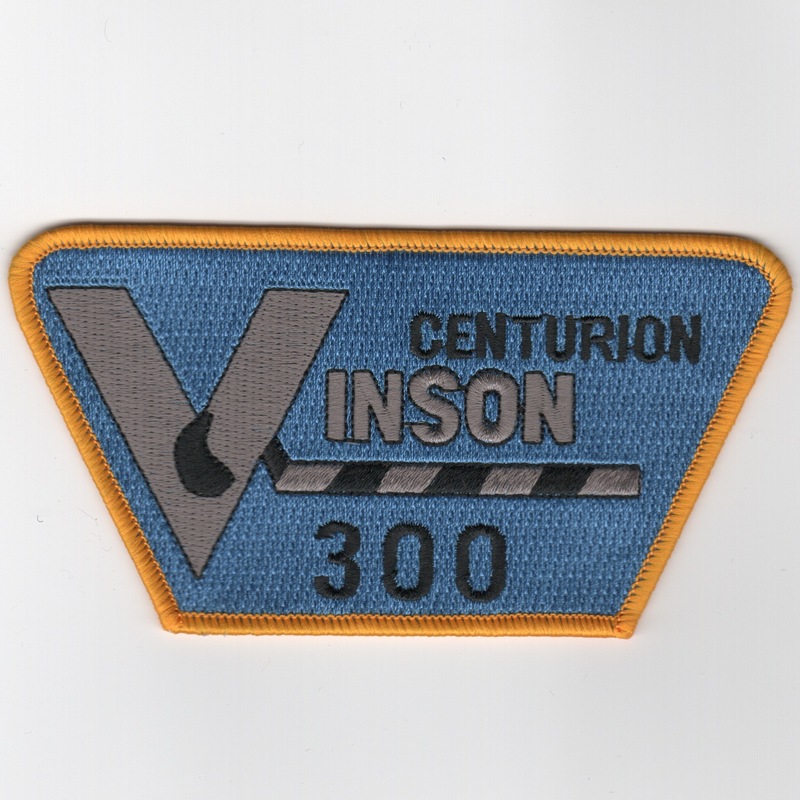 This is the "300 Traps" Centurion patch given to those who have 300 "Daytime" Traps onboard the USS Carl Vinson (CVN-70). 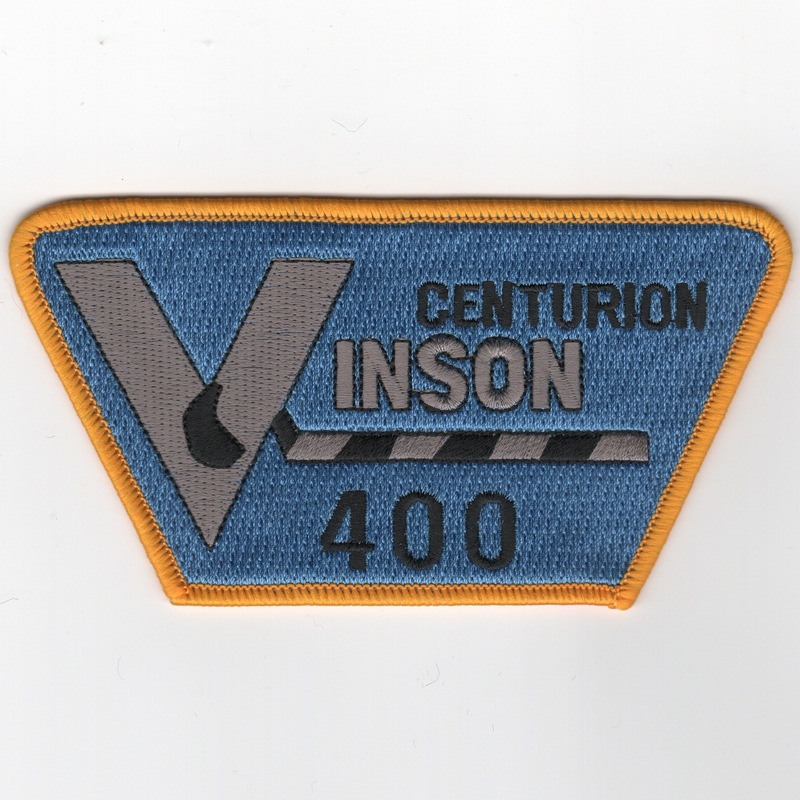 This is the "400 Traps" Centurion patch given to those who have 400 "Daytime" Traps onboard the USS Carl Vinson (CVN-70). 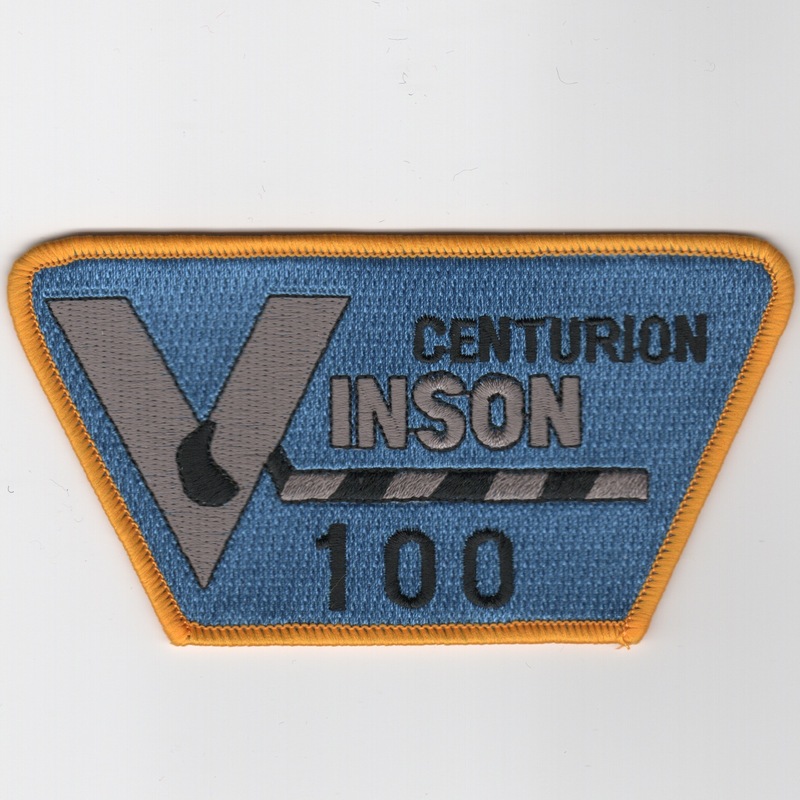 Use this link for the set of daytime Centurion patches (100/200/300/400) for the USS Carl Vinson (CVN-70). These patches do not have velcro attached. Homepage | Order CVN-70 Cruise Patches!